Our 46th Annual Leadership, Professional Development and Training Symposium will be held August 8-9, 2018. It is with great excitement that we return to the beautiful Renaissance Portsmouth-Norfolk Waterfront Hotel. They were such gracious hosts in 2008 and 2010. We eagerly return 8 years later with great anticipation. After last year’s fantastic Symposium in San Diego, we received overwhelmingly positive feedback. One junior officer remarked, “I received 2 days more professional, friendly conversations with Colonels, Navy Captains, Generals and Admirals than I have in my entire military career. And not by a little margin, by FIVE TIMES as much!” This sentiment was echoed throughout the volumes of thoughtful feedback received. Your Board of Directors heard you and are now at work lining up a host of dynamic speakers in support of this year’s theme “Embracing Diversity to Strengthen the Seas Services”. We intend to provide you the right training in two days to empower you to be a better leader. In addition to stimulating topics, we will include networking events for junior officers and mid-grade officers as well. We will also host our annual STEM community outreach program for middle through high school students —targeting our future leaders! 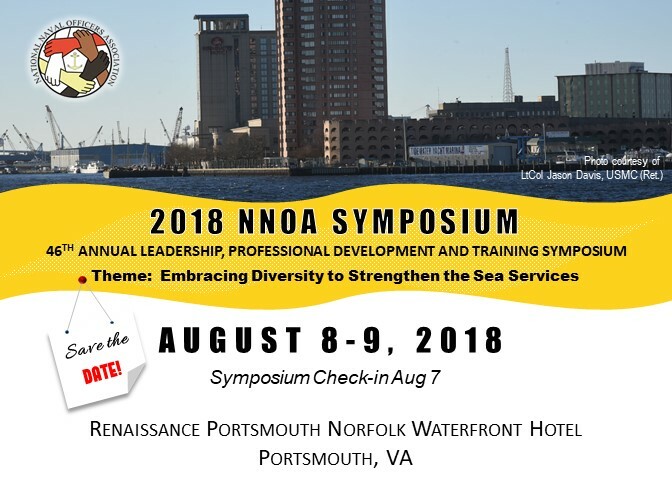 The two-day event will culminate with our awards banquet where we will recognize the superior efforts of our Chapters collectively and individual members who have been instrumental in helping us meet NNOA objectives of recruiting, training and retaining a diverse work force within the Sea Services. Last year, LtGen Bailey, USMC ret. challenged each of you to bring one new officer with you to our Symposium. I challenge you to bring TWO—I look forward to meeting you at the registration with your two first-time attendees alongside you. This year we will welcome back our Retirees and will give special recognition to our Founders who are still with us. Captain Claude Williams, USN, retired will join us for the first time in many years. He was with the original group that gathered in 1971 to discuss forming NNOA. We hope to also have LCDR Richard West, USN, retired in our midst. Without these two officers, along with the wisdom and foresight of LT Kenneth Johnson, Captain Emerson Emery, CDR Emmanuel Jenkins, CWO James Harris, LCDR Buddie Penn, LT Leonard Proctor, CDR John Fauntleroy, LT Edith Haynes and CDR Byron Wiley, we would not be in our 46th year of operation. Register yourself, register your fellow officers and I look forward to seeing you all on August 8th when we kick off our Symposium at 0800. Semper Fortis, Semper Fidelis and Semper Paratus. Interested in other ways to participate at the Symposium? Purchase a booth to represent your company onsite. 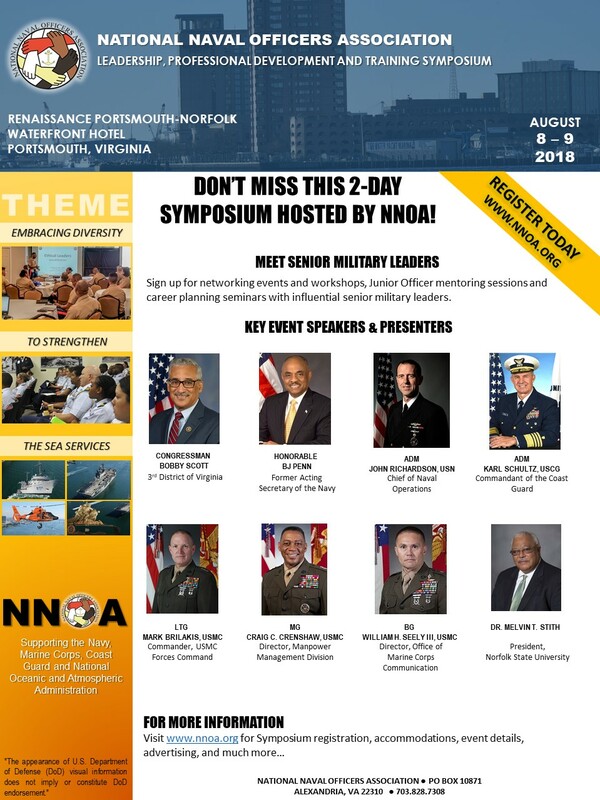 Advertise in the 2018 NNOA Symposium Program. You can also sponsor a Junior Officer or donate to various symposium activities. Welcome to the 2018 NNOA Professional Training and Development Symposium. We are excited to be in Portsmouth-Norfolk, Virginia for this year’s 2-day event where sea service officers come together to share, learn, and network. *Note: Speakers are subject to change. All attendees must register for the symposium. General registration is for members and non-members who plan to attend as a regular participant. Volunteers, speakers and attendees requesting JO funding (funding approved!) should select the appropriate tab to register for this symposium. We are looking for volunteers, especially retirees and previous Symposium volunteers to join our Symposium Planning Committee for 2018 and to work the days of the Symposium. If you sign up to work at the Symposium, registration is free. Free registration means you will not be participating in any of the Symposium sessions because you will be working. We will provide a box lunch if you work a full day. If you desire to eat the meals served at the Symposium, please select and pay for your meals when you register. Thanks in advance for volunteering. Last day to book hotel: July 13, 2018 – EXTENDED!! Have additional guests you forgot to include on your registration form? You can still order meals for them. Please click here to purchase additional meals. Also, please remember to indicate special meal preferences or dietary restrictions on the Meal Order form. Junior Officers (O1-O3) planning to attend can contact their service representative to request funds for the 2018 NNOA Symposium. 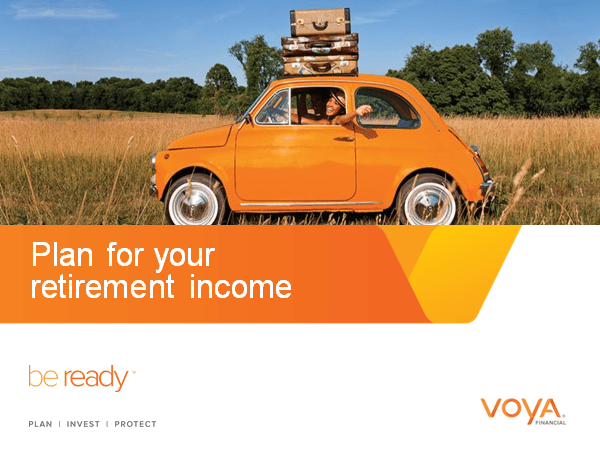 Please click here to submit your request and upon receipt, your service representative will contact you to confirm receipt and notify you when the funds are available. These funds are limited and will be issued on a first come, first serve basis. 7-16-2018 – Navy funding approved – contact CDR Michael Files (michael_files@yahoo.com) if you need TAD funds. Provide 1) NNOA membership status (member or non-member), 2) status (active duty, SELRES, FTS, civilian), 3) designator/job series, and 4) city/state in which you live. Please do not wait to request funds. 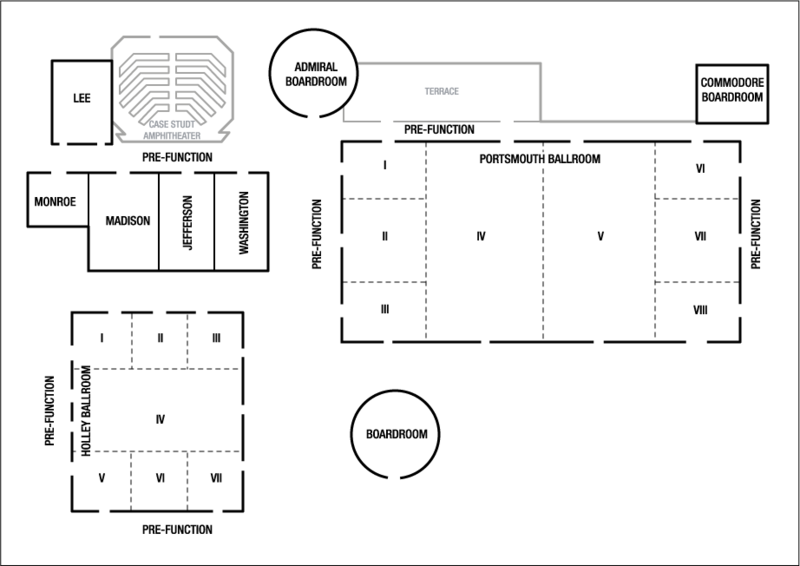 Our rooms are filled at the Renaissance Portsmouth-Norfolk Waterfront Hotel. We will send a link with contact info! PLEASE DO NOT CANCEL if you have room reserved and are not able to attend. First, contact LCDR Stacey O’neal ASAP at 619-701-5902 to offer your room to attendees who still need a room. Still need a room? Please contact the base inns near the Symposium. Member activities for the Symposium are below! Don’t forget to participate in the membership functions this year. We depend on your involvement. 2018 Amendment and Board of Directors Voting is Closed! Junior Officers (O1 – O3), Cadets and midshipmen from the Navy and Coast Guard Pre Commissioning Programs, and Senior Officers (O6 and above) will meet for professional networking. There will be food and beverages available. Open to the first 100 Junior Officers who register for the symposium and indicate their interest in attending. Mid-Grade Officers (O4 – O5) will participate in an interactive seminar with professors from the Joint Forces Staff College. This is an opportunity to sharpen your critical thinking skills. The topic will be Negotiations or Leading with Integrity. We will post updates here. Participants will receive a certificate of completion to include with their officer fitness report input. Following the seminar, attendees can join the JO/SO Networking Event in the hotel restaurant. Open to the first 75 Mid-Grade Officers who register for the symposium and indicate their interest in attending. Sign up for 30-minute career counseling sessions with our Senior Officers. Junior Officers planning to participate must signup during registration and receive confirmation for arrival time. NNOA 2018 “Speed Mentoring” session is an event where junior officers/civilians (Mentees) can sit down with senior officers/civilians (O-6 and above) for a 15 minute session. Each senior officer/civilian (Mentor) will be provided mentor questions. The questions will help facilitate conversation. Mentors answer questions and lead discussions during 15 minute sessions; at the end of the 15 minute session, mentees rotate to another table. Participants should register prior to the Symposium. Everyone should bring business/contact cards. We have arranged for two life skills seminars outside of the two-day Symposium schedule. If you are interested in learning how you can build wealth through owning real estate and learn some financial planning skills, sign up here. NNOA is hosting the Annual Science, Technology, Engineering & Mathematics (STEM) event for Local Middle and High school students during the 2018 NNOA Symposium. The event is scheduled for August 8, 2018 at the U.S. Coast Guard Base Portsmouth. 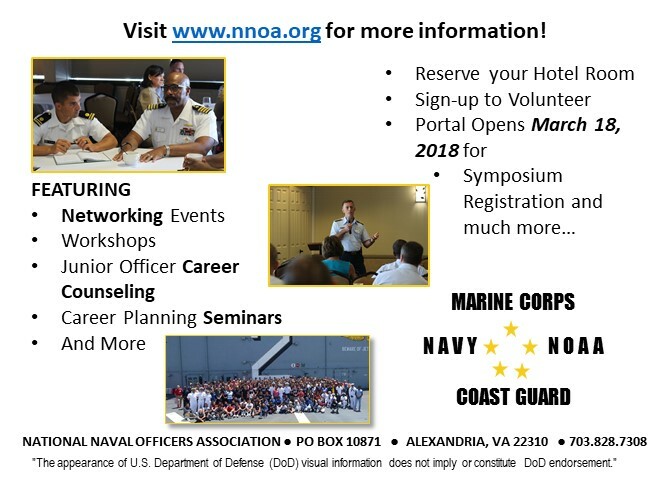 Be an Exhibitor at the 2018 NNOA Symposium. Purchase a booth to share your company information and network with event attendees and other industry leaders. Cost $75 ($50 for Members) per day for 6 foot skirted table. 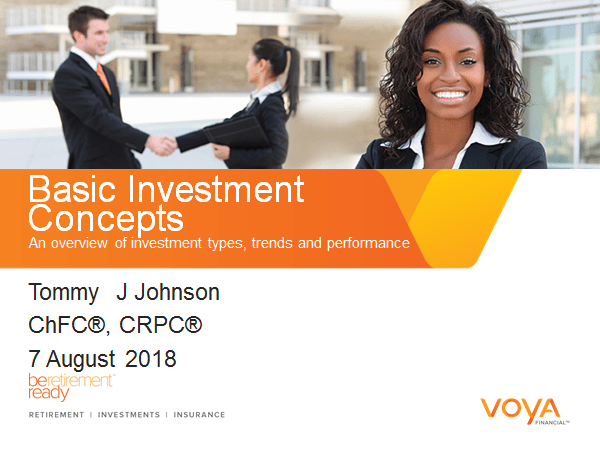 Please support our Symposium by purchasing an advertisement in our 2018 souvenir program booklet. We offer a variety of support levels from Patron ads to Full Page ads. We offer 50% discount for NNOA Chapter ads. Deadline for ad submission is July 2, 2018. With your generous donations and support, we can impact more aspiring Junior Officers at the 2018 NNOA Symposium. We offer the opportunity for you to Sponsor a Junior Officer’s symposium attendance, donate professional products, coaching services, financial counseling and more. Click for more information on how you can help. Interested in joining our list of NNOA Symposium sponsors? Download the Sponsorship package. Please call 703.828.7308 if you have additional questions or email it@nnoa.org.